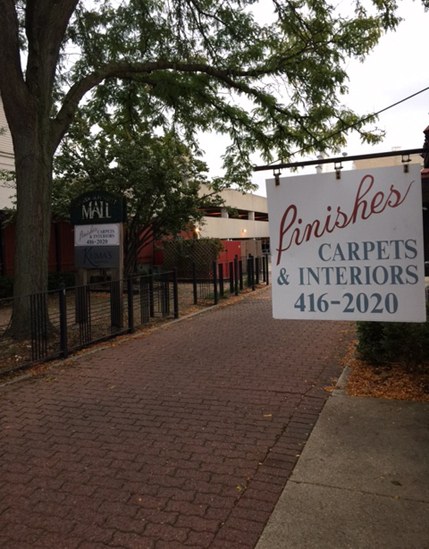 Welcome to Finishes, Carpets & Interiors, Online! Come and visit our store for more personal service! Finishes, Inc. now has financing available with a 6 month, no interest payment option. Note: We are still here....for 24 years now. We just expanded into the back portion of our showroom with the same address. Our main door is off the back brick walkway conveniently close to the parking garage/parking lot. It is more convenient for our customers to park and walk in. We have lot's of wonderful new products at great prices. Looking forward to seeing you. Patrick and Beverly (owner's). What our customer had to say about the design ideas and materials we supplied for their bathroom install..... (Installation: Hymers Construction and Son) "The inserts and the tiles being staggered on the wall, what a great idea. It makes a huge difference. It looks totally awesome. I just love it"
"The carpet looks great, and the install team really worked fast. That means they worked well as a team. A big part of the reason that I am a repeat customer is that we have lived in this house for 25 years! But I always appreciate your friendliness, quality materials and efficiency. Likewise for Pat - you guys run a good shop!" " The re-finished stairs look great. The guys cleaned up at the end of each day, which was very nice. They put everything back and all items were put back in their original place. Even the pictures were re-hung." "Finished job looks great! Thanks for doing the work in such a timely manner." "Your team did another great job. We've used Finishes for three separate projects now - each time was impressed with the creative help, professional service, and friendly staff! Would HIGHLY recommend them!" "We've used Finishes for three separate projects now ... each time was impressed with the creative help, professional service, and friendly staff! Would HIGHLY recommend them!" "We absolutely love it. Your guys exceeded our expectations. We will highly recommend you. Our neighbor may come and see you as well." "When I was looking for tile for my kithen backsplash, I found the sales girl at Finishes and Bev the owner extremely helpful. They helped me with a great design and a tile selection before I even made a purchase. I did not find that type of personalized service at the larger tile stores. I coud not have done it without Finsihes." From: Paula V. of Naperville. "It turned out awesome. It was worth every penny and then some. Their team is so neat and tidy, they treated our home like it was their own. Not to mention they take pride in what they do and they are workaholics. I am absolutely speechless." As far their service experience with Finishes, Carpets & Interiors (Jennifer), "This would not have happened without her. She is exceptional and very patient. I felt so good about the entire experience." "We’re really happy with the flooring. The carpet feels and looks so much better than the old stuff. Makes it seem almost like a new house! Having the tile in the “dog room” gives me peace of mind in case they have an accident, or slop their water when they’re eating, and it, too, looks great." "Everyone at Finishes was very professional and courteous. It was a pleasure working with all of you. When it comes time to update the counters in our kitchen, I’ll be sure to give you a call!" "I absoluetly love it. Thank you. They were just great." "There is no doubt that we made the right decision to again have Finishes install flooring for us. The first time it was a beautiful wood floor... oak with special walnut accent. This time it is a beautiful exterior tile on our front porch. What a great entrance to our home!! Thank you for your expert help from selection through installation."